Fall is always an interesting time at the movie theater. You get an interesting mix of potential blockbusters and Oscar hopefuls wanting to grab our attention. This fall, Sony is offering a remake of a beloved classic, a sequel to a film based on one of the most popular books in recent memory and an original film starring two of the most bankable stars in the world. Here is Sony’s fall movie preview. Director Antoine Fuqua brings his modern vision to a classic story. With the town of Rose Creek under the deadly control of industrialist Bartholomew Bogue (Peter Sarsgaard), the desperate townspeople, led by Emma Cullen (Haley Bennett), employ protection from seven outlaws, bounty hunters, gamblers and hired guns – Sam Chisolm (Denzel Washington), Josh Farraday (Chris Pratt), Goodnight Robicheaux (Ethan Hawke), Jack Horne (Vincent D’Onofrio), Billy Rocks (Byung-Hun Lee), Vasquez (Manuel Garcia-Rulfo) and Red Harvest (Martin Sensmeier). As they prepare the town for the violent showdown that they know is coming, these seven mercenaries find themselves fighting for more than money. In the 1960 original, which was a remake of Akira Kurosawa’s 1954 classic, Seven Samurai, Steve McQueen tried to draw attention from Yul Brynner by taking off his hat to shade his eyes as he looks around just before they drive the wagon to the graveyard and bending down from his saddle to dip water with his hat as the whole crew crosses a stream. Finally, Yul Brynner said to him, “if you don’t stop that I’m going to take off my hat, and then no one will look at you for the rest of the film.” The oneupmanship between Yul Brynner and Steve McQueen spread to the other actors, and they all started pulling stunts of their own in order to get the audience’s attention. While a lot of the attention-hogging did make it into the finished film, director John Sturges was terrified by how quickly he lost control of his cast. Academy Award® winner Ron Howard returns to direct the latest bestseller in Dan Brown’s (Da Vinci Code) billion-dollar Robert Langdon series, Inferno, which finds the famous symbologist (again played by Tom Hanks) on a trail of clues tied to the great Dante himself. When Langdon wakes up in an Italian hospital with amnesia, he teams up with Sienna Brooks (Felicity Jones), a doctor he hopes will help him recover his memories. Together, they race across Europe and against the clock to stop a madman from unleashing a global virus that would wipe out half of the world’s population. Inferno also stars Irrfan Khan, Omar Sy, Ben Foster and Sidse Babett Knudsen. In The Davinci Code, Ron Howard’s first envisioned choice for the role of Robert Langdon was Bill Paxton. Paxton was interested but turned it down because of scheduling conflicts. Russell Crowe was then seriously considered for the role but ultimately Howard decided on his long-time friend Tom Hanks for the role. Other actors considered for the part were Ralph Fiennes, Hugh Jackman and George Clooney. On a routine journey through space to a new home, two passengers, sleeping in suspended animation, are awakened 90 years too early when their ship malfunctions. As Jim (Chris Pratt) and Aurora (Jennifer Lawrence) face living the rest of their lives on board, with every luxury they could ever ask for, they begin to fall for each other, unable to deny their intense attraction… until they discover the ship is in grave danger. With the lives of 5000 sleeping passengers at stake, only Jim and Aurora can save them all. Passengers also stars Laurence Fishburne and Michael Sheen. 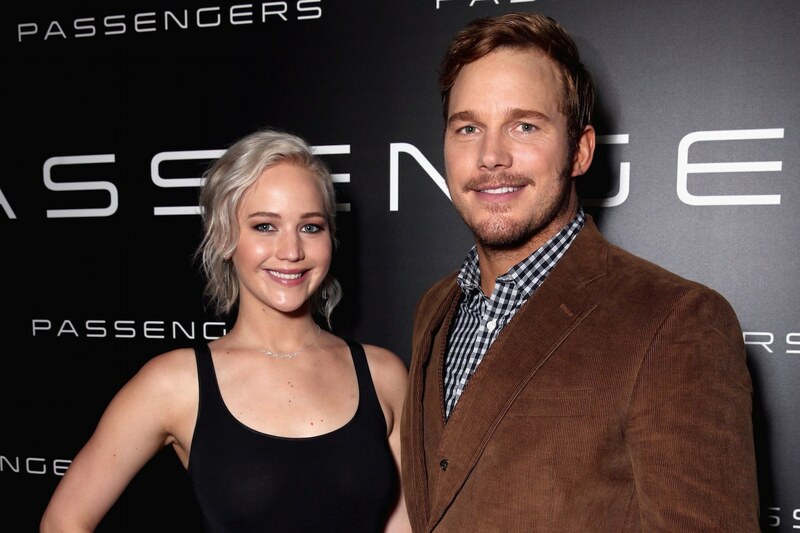 Jennifer Lawrence and Chris Pratt might be a studio bean counter’s dream pairing. Jennifer Lawrence was ranked as the most bankable star in 2013 and 2014, while many sources proclaimed Chris Pratt to be the most bankable star of 2015. Please keep in mind that release dates are subject to change.